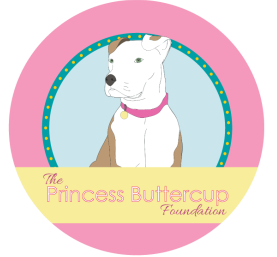 The Princess Buttercup Foundation ("PBF") is a New Jersey corporation formed in October 2010 by Valerie Paster. We do not have our 501(c)3 status at this time. PBF was inspired by a dog Valerie met at a kill-shelter that would have been put to sleep if she had not intervened. If you couldn't have guessed, the dog's name was Princess Buttercup. From there, Valerie decided it was time for her to make some sort of change for pit bull dogs in shelters, and from there formed her own rescue group like she had always wanted to do. PBF is a very small, all volunteer-based organization with no facility at this time. PBF can only accommodate a few dogs at a time due to lack of available foster homes and funds. While PBF would never turn away a dog based on their breed, appearance, health, or age, our main focus is to rescue, train, re-home, and promote pit bull dogs. PBF also holds a firm belief on providing humane education classes on animal kindness, care, and safety to children and teens. A lot of people think our rescue is named after the movie called The Princess Bride, but sorry to inform everyone, it's not. The Princess Buttercup Foundation was inspired by our first rescue dog known as Princess Buttercup ("PB"). Our Founder & President, Valerie Paster, met PB at the local shelter she used to work for. PB was very mouthy when she first arrived at the shelter. She wasn't aggressive to people, in the least bit, but she was a young, high-energy dog who seemed to have very little training. Nonetheless, she passed her temperament test, which is required by the shelter before placing animals on the adoption floor. PB was on the adoption floor for about a month before she was suddenly taken off and moved into the receiving area. A note was placed on PB's cage that read, "Staff may only walk me." Of course, this sparked Valerie's interest. Why were staff only allowed to walk PB? So, she took PB out for a walk to figure out why she was labeled "staff only". Valerie found PB to be a sweet, lovable, playful dog. Later, Valerie approached the manager and learned that PB was moved back into the receiving area because she was too mouthy for the volunteers. PB then became Valerie's project dog. The Princess Buttercup Foundation was born after no other rescues could accept PB into their rescue. It's understandable why other rescues really couldn't take her even if they wanted to... and that was due to lack of money to care for a dog who'd potentially be a long-term rescue dog. PB was homeless for nearly a year before finally being adopted. It cost us thousands of dollars to pay for PB's boarding fees, veterinarian bills, and so forth. It was a struggle to find PB her forever home, but she eventually did (thanks to a local NJ pit bull rescue for cross-posting her on their website). PB unfortunately passed away on April 14th, 2014. She will always remain in our hearts. 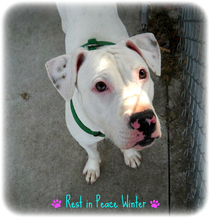 Winter was one of Valerie's project dogs at a local animal shelter. She was deaf and had no training. She was killed because she was reactive to dogs and deaf. Winter was another big inspiration for the formation of The Princess Buttercup Foundation.